Originally from Godoy Cruz Mendoza Argentina, Nicolás Arnáez is now based in Edmonton Alberta, Canada. 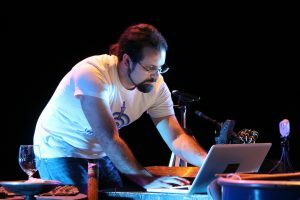 His music compositions use as a root the concept of interactivity in music, which applies in electroacoustic pieces with real-time sound processing, the creation of interactive sound installations as well as into acoustic ensembles. This pieces have the characteristic of using the space of reproduction as an expressive music parameter; sounds are carefully spread on the space with specific trajectories and locations, carefully loaded with constructive characteristics, this is technically accomplished in a multichannel speakers distribution by the use of different spatialization tools like intensity panning, two or three dimensional ambisonics and VBAP, this is normally combined by performers’ specific positioning, movement in space indications, among others. Nicolás’ works and contribution to the cultural scene have been awarded in Argentina and Canada; his pieces have been performed also in Brazil and the United States. He is an active and experienced sound technician and sound projectionist on both, the popular and new music scenes. He is now an ABD Doctorate in Music Composition at the University of Alberta.